Florian Pugnaire and David Raffini pursue their individual artistic practices and collaborate for experiential body of work, both bringing forward their respective approaches and understanding of art, through placing art object in a continuous flux of definitions. Hinting at the ungraspable and inexplicable nature of art and its multifarious manifestations, Pugnaire and Raffini create curious and intriguing body of work, that poses simple yet urgent questions forward, while building a habitat to seek answers. The exhibition at Galerie L’etrangere in London, is a coming together of two different investigations, where artists have followed a singular methodology, concentrating on an industrial object as their modus operandi. Pugnaire and Raffini have been interested in cars as symbols of 20thcentury, where industrial revolution has taken a new turn towards individuation of mobility and consumption. The two works in the exhibition, Expanded Crash (Show Me)(2016), and Dark Energy(2012), both concentrate on cars, the former centralizes around a red Opel-GT and the latter places a white Volkswagen Transporter as its protagonist. Dark Energyis a mid-length film that documents the last journey of a gracefully aged car in its actual function, before transforming into something else. The film, follows a diegetic editing where two narratives follow a different directional unfolding. That is to say, the film is interspaced with scenes from the journey taken through rural areas and the phase of explosion and while the car in first person perspective leads its way through valleys and rivers, mud beds and sunshine, we as audience also witness its destruction in reverse. The dual narration of the film, provides an expansion where the viewer/witness and the protagonist merge and diverge in flux. In Dark Energy, the sky gets darker and cloudy, as if preparing for a storm indicating the inescapable end of the protagonist that is accelerating in speed. Audiences as protagonist and witness are prepared for what is ultimate and expected, aided by the sound track. Expanded Crash (Show Me) takes place in a closed environment. The subject of the movie, the car in transitional form is placed as the centre of attention. The transition the car is going through is not immediately accessible, as in the small tremblings the cracking of the surface paint may be due to any unexplained reason. As the transition proceeds and the impacts of the compression heighten, we see the car being crushed from within. The film, is not a straightforward documentation, but a filmic interpretation of a transition where the object-in-action takes on a subjective stance. The atmosphere of the narratives being told reference heavily to film history, especially recalls body-horror genre where the environment charges the narrative impeccably. Supportingly, the artists reference John Carpenter’s Christine (1953), as a significant influence, in which a Plymouth Fury turns into a murderous machine with an ability to regenerate. In both films, the artists play with the gaze of the viewer and the position of the narrative, resulting in oscillations between the animate and inanimate, the subject and the subjected-object. For Pugnaire and Raffini, everything is in constant transformation and their work captures the continuity of change, pronouncing its course of action in heightened manner. Cars, like all engine operated machines, form the demarcation between animate and inanimate objects. In a way in which when inactive, cars can be categorized alongside still objects such as forks and hammers: objects that only gain function when placed in use and action. That is to say, a fork only becomes a fork when one uses to pick some food with, in order to aid his/her eating. On the other hand, cars when activated, as in the engine is turned on, they become animate. Their mode of activity does require human interaction – besides the current technological inventions where driverless cars are in production. Pugnaire and Raffini’s interest spring here, with their approach to sculpture as an animate form. They revise the definitions of what makes a sculpture and its modes of production. A sculpture, in modernist terms, rises off ground, that one can walk around and that is shaped from its exterior, as in sculpting from marble, concrete, plastic, etc. Moreover, animate sculptural forms have been mostly achieved by utilizing organic materials such as fungus or moss, but Pugnaire and Raffini place an inanimate object into the equation. For the artists, sculpture takes a new form, a new mode of production where the object of choice is shaped from within, moreover the process of shaping is uncontrolled and the agency of the artist(s) is handed over to a machine: an in-built compressor. 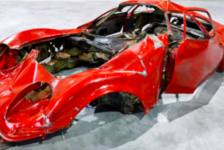 Moreover, the artists have exhibited cars in flux of change in exhibitions, with their Expanded Crash, Granturismoseries, showcasing the car in slow crunching. However, the artists have not only centralised car as their main object of inquiry, they have also transformed a digger -a symbol of innovation and progress commonly used in Union of Soviet Socialist Republics, into a living and dying sculpture. Infine(2010) realised at Palais de Tokyo, invited audiences to witness the last hours of an industrialised object losing its forces of animation. There is more to Pugnaire and Raffini’s body of work, that is beyond an insertion of agency through objects that contribute to art making, but an exploration of presences that exist beyond the purview of human conception. Object oriented ontology or in other words, speculative realism decentralises human as the source of intellect and perception while leaving inanimate objects the place to take their own course of action in relating to the world as such. The Volkswagen Transporter thence becomes the subject, that goes through various challenges in nature, through a passage of time, deals with, responds to and gets effected by the experiences that cumulate along its journey. The allegorical structure is then transversed into a new realm of primary experience that is owned by a car in the first instance, and then made accessible to everyone and everything, including human audiences. A similar set up is in place for Opel-GT, intending to depict the object’s ‘as such’ness in authenticity and beyond the immediate capitalisation of human gaze. Pugnaire and Raffini take the process of object-oriented approach, further. They explore the possible manifestations of the processes they set for cars, investigate other forms or materials they might give birth to. The sculpture/paintings, which are derivations or the initial precursors of the protagonists, that also appear in both films, accompany the two films in the exhibition. Three red panels hanging on the walls emerge as the interruptions of car’s surfaces in transition and one silver coated steel sculpture leaning on the adjacent wall takes a more active role in the Dark Energywhere, with two others, they greet the car at its en-passing towards the storm, leaving an innuendo on air. l’étrangère is pleased to present Show Me featuring, for the first time in the UK, collaborative film and sculptures by Florian Pugnaire and David Raffini whose award-winning works have been included in the Centre Pompidou’s collection in Paris, France. Pugnaire and Raffini play with the idea of an object generating its own various alterations —transfiguring and evolving within its own skin, of its own accord. These material transformations sometimes take on a fictional dimension in the production of a film, whilst their sculptural works appear to be remnants of an event (a crash or catastrophe). Many appear to be frozen in the middle of a physical transformation — unfinished, they have an air of being consciously self-inflicted by the object itself.